SaaS companies also provide businesses with their services; everything from cloud based storage (Amazon Web Services) to marketing (HubSpot). The beauty of a SaaS company is that it develops an initial core service which it can then sell multiple times over to different customers, without having to amend its service. SaaS companies also build using other SaaS businesses, a viable option to start from or scale up with. Having used SaaS companies to organise this event (Eventbrite, MailChimp, Facebook Ads), I introduced the event by highlighting how SaaS companies and their tools are making it easier and cheaper to start a tech business today, from anywhere and for less, running through the advantages and trends in how building with SaaS enables businesses to stay agile and how the availability of more and more tools is aiding startups. 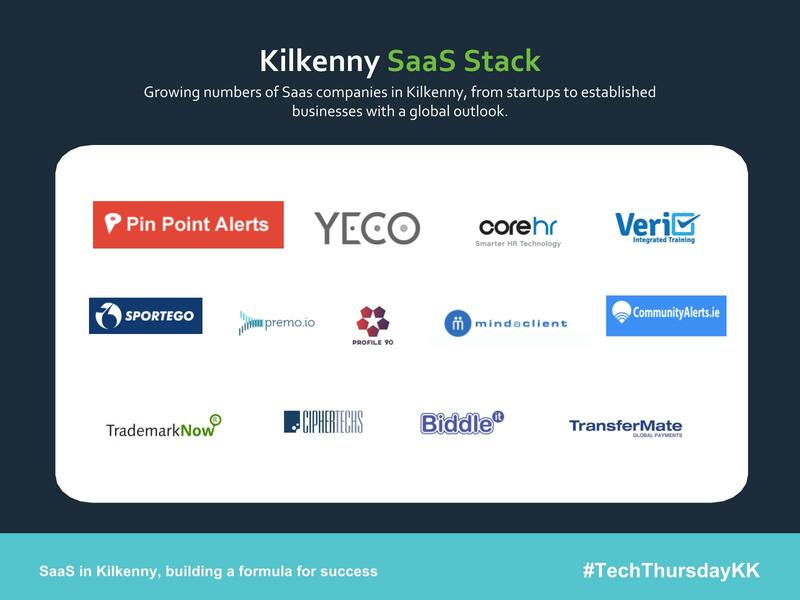 There are a growing number of Saas companies in Kilkenny (13 at last count) with a global outlook, ranging from startups to established businesses. 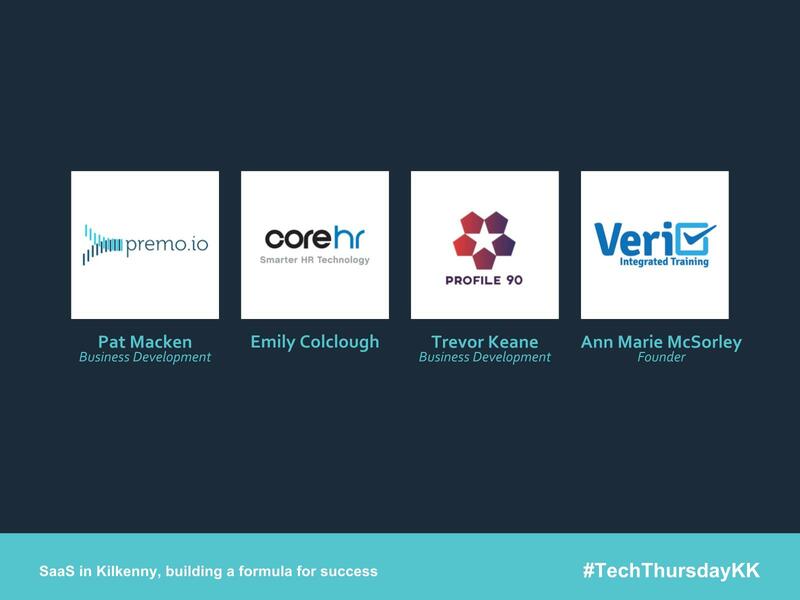 This Tech Thursday we showcased four of these companies and they shared their insights and experiences about running a SaaS company locally, exploring digital transformation, design and the future of business in Kilkenny. Pat shared his start up trajectory. Premo is a new online platform which offers clients a centralised marketing platform to execute social media activity, data analytics research and create engaging promotional campaigns. Premo was a natural progression from an existing sales and promotions company to SaaS. Pat described the process of launching like "a boat in the water, bobbing up and down on the waves - learning from each wave of feedback from customers". Premo work very closely with clients they have onboarded. From there they can grow by learning. Pat acknowledges that using existing SasS is something they could have used to build and learn faster, "Use SaaS to build SaaS". Advantages of being based in Kilkenny: Quality of life, cost of living and surrounded by good colleges to provide qualified staff. CoreHR are a leading provider of cloud-based human capital management and payroll software. Emily charted the story of CoreHR and how it was founded in 1982, eventually starting a Kilkenny office initially for serving one of its large clients in the area: providing a payroll solution to Glanbia. CoreHR have 3 offices in Ireland: a head office in Cork with satellite offices in Kilkenny and Dublin. Having received a cash injection from UK investors the company is growing again. Advantages of being based in Kilkenny: Easy lifestyle, cost of living, quality and quantity of festivals. Challenges of being based in Kilkenny: Recruitment of qualified candidates for roles in Kilkenny, recruitment to the other offices is easier. Sportego is a data capture company, aimed at the UK and Irish markets, designed to help professional sports clubs and organisations analyse, understand, engage, interact with and convert their fans. Profile90 is a new smart-tech platform that takes traditional soccer scouting to the next level by integrating the latest scientific insights. In Profile90 Trevor is developing his second SaaS business from Kilkenny. A cloud based platform that tracks physical, mental and social behaviour, Profile90 is a spreadsheet killer. He described his biggest competitor as being the pen and paper. Currently, Trevor is in the process of signing up several British league clubs. As this is a very new product concept he has used prototyping to develop and describe the SaaS features and benefits. Veri is a software dashboard for training managers to streamline and quality assure their training processes. Ann Marie developed a software solution to cope with a pain point she was having in her own business, then realising the opportunity with the solution, now offers SaaS service to other businesses. Ann Marie described how the company was now after learning from close customer interaction and feedback and is in the process of taking the product to the next level. PANEL TALK - What if Kilkenny City were a SaaS company? How could we make it work? The panel talk was built around the four questions above. 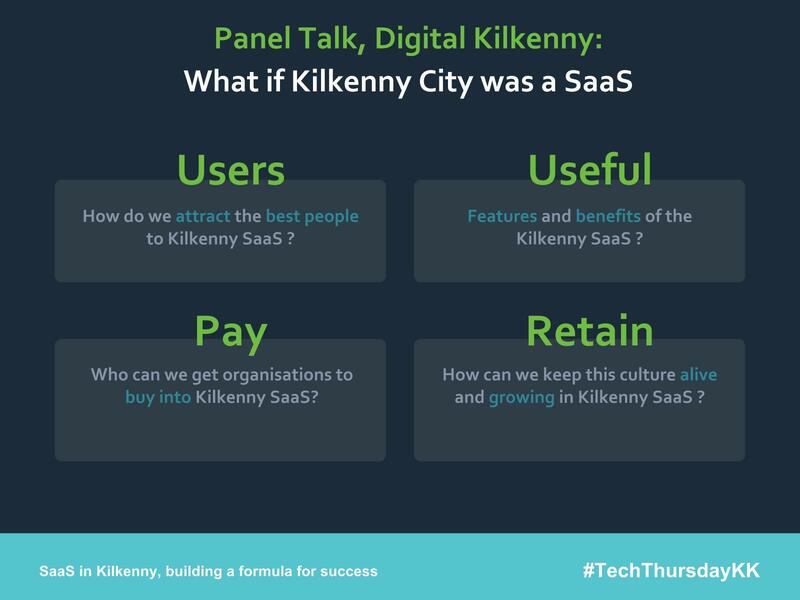 Imagine if Kilkenny City were a SaaS company, how would we answer these four fundamental questions for success in SaaS? Recruiting through staff as they are the advocates for the company. There is more longevity from staff referrals. More interaction with international companies based in Kilkenny regarding tech - explore solution just as CoreHR did at the start. Encouraging mature students to join the tech workforce, diversity is a strong ally in today’s tech environment. Attracting students from the surrounding colleges to build tech startups here. Kilkenny should be seen as a tech scale up city. Look at options within the county funding and grants. Explore proactive approaches to tech solutions high street retailers could adopt to develop their businesses and grow their customers. 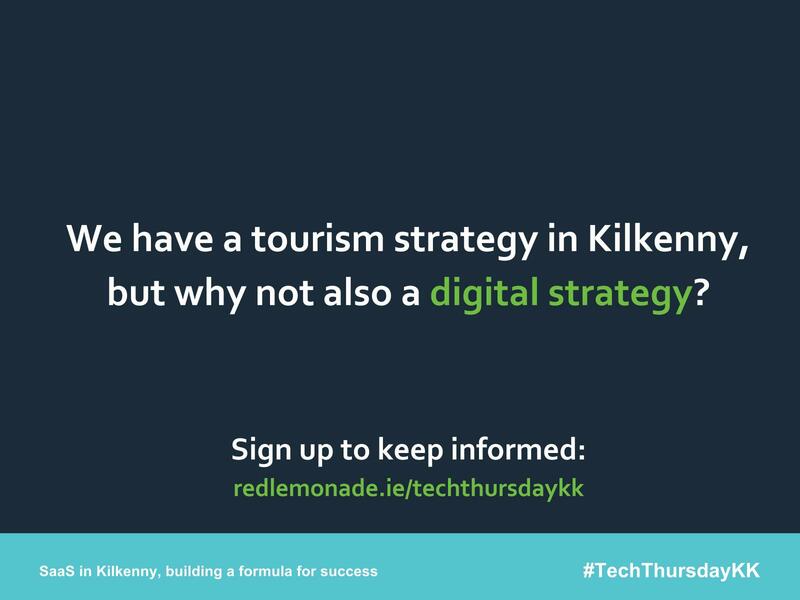 Kilkenny has a Tourism strategy, but why not a digital strategy? A lot can be learned from Kilkenny's strong and professional tourism organisation. Many thanks to the Local Enterprise Office, Kilkenny and Langton House for sponsoring the event.